We are so excited to have Kristine and Tabatha working with us on this amazing project for the next academic year! We will be sure to post updates along the way. This entry was posted in Archives, Collections, Events, History, Student projects, Union Theological Seminary History on September 29, 2016 by Elizabeth Call. Hello Burke world! I joined Union’s library staff this February, filling a vacant Project Archivist position whose previous occupant guided the successful processing of the William Adams Brown Ecumenical Library Archives, the Missionary Research Library collection, and more with the support of the Henry Luce Foundation and other grant-funding organizations and individuals. I’m originally from New Mexico (a place with an aridity that I’m sorely missing during my first summer on this swampy island), and recently completed my M.L.I.S. in Archival Studies from McGill University in Montreal. Coming into this community has been in many ways a rigorous crash course in ecumenical studies, but happily a smooth process of folding into and keeping step with the everyday work of a small academic archive situated in an expansive research university. The learning curve I’ve ridden this spring has been notable given my status as a new archival professional with interests both in academic librarianship, special collections and rare books and archives. Prior to coming to the Burke, my background in archival practice had been situated in the U.S. and Canada, and primarily saw me leading small survey and processing projects in cultural heritage, art and academic settings with an acronym-riddled arsenal of best practices and archival theory at my disposal. Phyllis Trible at work. Trible’s archive consists of text-based, visual materials and realia reflecting Trible’s historic career in Biblical criticism, feminist studies and the Old Testament. Her papers bridge the UTS Archives to the Archives of Women in Theological Scholarship, and is an actively growing collection now available for on-site consultation. The extent of my religious studies acumen prior to joining the Burke was limited to my middling knowledge of the Presbyterian beginnings of the small Midwestern town where I lived during college, the particular dryness of Eucharistic hosts during my Catholic adolescence, and a fairweather interest in the eternal consequences of my meager mortal actions. I come from a literary studies and critical theory background, and have always been drawn toward the nuanced, less visible ways in which people and communities of people make sense or chalk up their experiences of this life, those experiences of religion and spirituality that respectively become occasions for world-making, diasporas, rituals and art forms that seem endlessly abundant in relief and hope. Part of what compels me toward the humanities, history and narrative has been the particular privilege and work of acknowledging my own ignorance of the world beyond my own, the limits of individual perspective, but also of the ways in which knowledge is produced to bind our subjectivities to one another. In the process of memory-making and historicization, I am equally interested in the erasures and violences that also constitute a part of the ways in which we understand our spiritual and social worlds. Theology, perhaps more than any field I’ve taken up so far in my life and nascent work, attests to this pervasive knee-jerk desire to balance sense-making with reverence, critical thought with faith, silence with articulation. This process of coming to know, even in silence and subjectivity, is what drew me to library science, and archival practice in particular. The projects that met me at the Burke did not disappoint. As the Project Archivist responsible for the processing, housing, and long-term preservation of the UTS 1 Archives – an aggregate of archival collections stemming from faculty, alumni, and other Union-affiliated individuals acquired by the library – I have become a sudden steward of a world steeping in interdisciplinary, interdenominational discourse. From my first day in the library, I realized that I had entered a space that, though a slim five-block walk north of Columbia’s Morningside Heights campus, is unique in its historical and academic context. As one of my colleagues told me on admiring the crucifix-emblazoned doorknobs leading into our on-site archival space, “The divine is in the details”. It’s indeed astonishing to be a custodian of archival collections outside my formal background and to learn so quickly and richly about the haptic space the seminary is situated in, the gargoyles that greet me in the stairwell, the filigreed doorknobs evoking Union’s denominational past, the engraved edifice on the neighboring Jewish Theological Seminary (…“And the bush was not consumed”), or the limestone gauntlet of the neighboring Interchurch Center (a.k.a. the God Box). 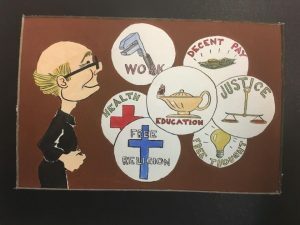 Two frames of Max Alden Coots’ cartoon thesis submitted in fulfillment of his M.Div./M.Ed. in 1953 from Teachers College and UTS. Coots, an artist and Unitarian Universalist Minister, is one exemplar of the visually and conceptually compelling approaches to religious education that Union alumni and faculty have practiced throughout their careers. Processing collections coming from individuals like these is not only a privileged sort of intellectual labor, but one that begs to be curated and made accessible to researchers beyond the auspices of Union’s immediate audience. Drawing on the talents of our in-house staff and from the support of our larger organization, I feel confident that new knots of researchers, students, scholars, and armchair theologians will find themselves as intrigued by the gems to be found at the Burke as I have become only six months into this new role through a mix of digital curatorial work, on-site exhibitions, cross-institutional collaborations, and streamlined practices for uploading and curating finding aids. As I scythe through the work accomplished and the projects that I’ll undertake over the next two years, I am becoming pinchingly aware that I’ve just begun to skim the surface, to scratch the bed of all the intellectual and physical labor that lies ahead. As we approach our goal of 30-35 linear feet of processed archives per month, and as the steamy heat lamp of New York City summer settles in, I could hardly feel more energized to embark on the remaining mountain of collections. Where do you even begin to excavate the history of glory? Flick light, switch on dual monitor. Select Start. This entry was posted in Archives, Collections, History, Union Theological Seminary History on July 22, 2016 by Rebecca Nieto. Credit: UTS1: Roger L. Shinn Papers, 1920-2010, Series 3D, box 1 folder 1, the Burke Library at Union Theological Seminary, Columbia University in the City of New York. – Houser’s reply to Shinn, Dec 26, 1940. Even as their differing positions took them further and further from each other, Shinn and Houser diligently reminded each other of the shared aspects of their convictions. The tone of their letters remained light even as they disagreed, with friendly banter and frequent apologies for not having the time to write more. 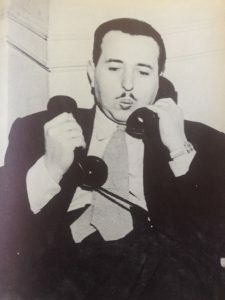 As Shinn’s number came up in the draft he wrestled with whether or not he should join the Army or take advantage of his exemption as his mentors, Reinhold Niebuhr and Henry Sloane Coffin, advised. When he decided that, given his support for the war he felt compelled to serve in it, Houser was one of the first people he told. Houser wrote back disagreeing with his friend but supporting his decision to accept the consequences of supporting the war. Neither friend shied from challenging the other to change his mind. 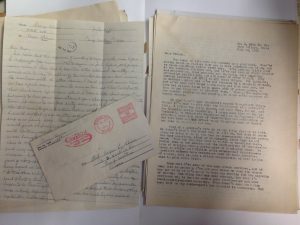 As Shinn prepared to go to war and Houser realized that he would not be able to return to Union, their letters tell their sadness about how their paths, and those of their community at seminary, had diverged. This sadness and the strength of their differing convictions only made their theological and ethical debates more urgent. 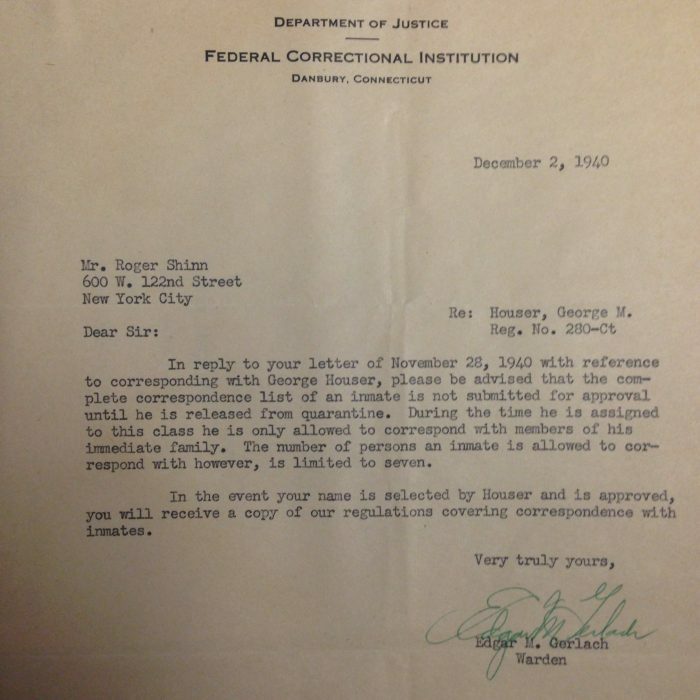 A letter from the warden of the Danbury, Connecticut prison where George Houser was incarcerated, notifying Roger Shinn that he is not authorized to correspond with Houser. After 1941, the correspondence between the two men appears to stop. No more letters to or from Houser appear in the Shinn collection. Their lives continued to head in different, though related, directions. Houser moved to Chicago to work for the Fellowship of Reconciliation, a pacifist anti-war organization, and then turned his attention to civil rights issues within the United States. He helped to found the Congress for Racial Equality in 1942 and participated in the original Freedom Ride before devoting the rest of his career to abolishing apartheid and colonial rule in Africa. Rev. 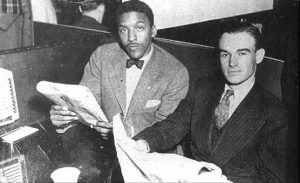 George Houser with fellow CORE member and civil rights fighter Bayard Rustin at a sit-in in Ohio. Credit: Congress of Racial Equality, the New York Times. This entry was posted in Archives, Collections, History, Student Entry, Union Theological Seminary History on April 29, 2016 by Carolyn Klaasen. That sounds familiar! As I sifted through the materials in the Burke archives, reading student publications and looking at pictures that were over forty years old, I kept recognizing my classmates in these relics from our predecessors. My project was tracking a series of student-driven movements in the 1960s and 1970s that radically transformed the academic program and governance structure at Union. One of those, the Free University of 1968, began with a late-night call to mobilize seminarians because the police were moving in on protests across the street at Columbia. It was after the end of the semester, and well after midnight, but the students rallied and turned out to support the protestors. That happened my first year at Union, when the Occupy Wall Street encampment in Zucotti Park was raided. That night a group of us had settled into the Social Hall with cups of coffee and end-of-semester papers to write. But within fifteen minutes of the first tweets announcing the raid, we were all headed downtown to see how we could help. It happened again in 2014, as the Union community turned out en masse to participate in #BlackLivesMatter protests across New York City. Back in 1968, after a night of supporting Columbia students in their confrontation with the police Union students came home and looked at their own community. At Columbia, students were protesting major justice issues: links between the university and the institutional apparatus supporting the Vietnam War, as well as the gentrification of Harlem. But Union students recognized that their own institution, too, was complicit in perpetuating injustice. The last week of classes was canceled and replaced by what was called the Free University as the entire campus instead spent the week investigating Union’s problems and making a plan for moving forward. This balance between protesting injustice outside our walls and engaging in serious soul-searching within them is also one I recognize in my classmates. Union in Praxis, activism surrounding the Jackson Mitchell Chair, the Latinx Working Group, #WhoseUnion – all of these belong to the same tradition as the Free University. And like the movements I’ve seen in my time at Union, the Free University was a messy endeavor. Some students were frustrated that activism was interrupting their studies, and considered the Free University a waste of time. There was tension between those whose energies were focused on issues at Union, and those who were pulled toward solidarity with the Columbia protestors. The Free University ended with the academic year but the issues it raised continued to be addressed, first by a working group called the Union Commission and then by the Union Assembly, a body of faculty, students, and staff that governed the school for five years. Major changes occurred during this time: the switch from an A-F grading scale to our current system, closing the School of Sacred Music, replacing the B.D. with the M.Div. and the Th.D. with a Ph.D., and Union set a goal of recruiting and admitting students and hiring faculty, “so that Black persons will number at least one-third of the total… and so that women (including Black women and those of other minorities) number at least one half the total.” Here, too, I recognize my classmates in the dozens of past students who participated in the necessary, but rarely glamorous, committee work of negotiating and discerning a better path forward for the seminary on first the Union Commission, and then the Union Assembly. Working alongside faculty, administration, alumni/ae, and staff for five years, students contributed to major changes in how Union functions. All of this work – from confrontations with police in the streets to policy changes within Union – is activism. All of it is #LoveInAction. 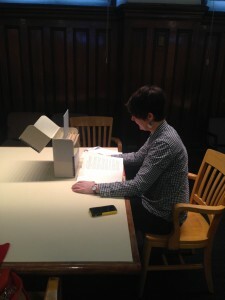 Carolyn Klaasen, among many things, is a current PhD student at Union Theological Seminary and one of the student curators for the library’s #LoveInAction project. Carolyn’s exhibit is currently on display through to May 16, 2016 on the 1st floor of the Burke Library. Her exhibit is a look into activism in education exploring the archives of the Union Commission and Union Assembly, and the Student Interracial Ministry, both of which were student-driven. 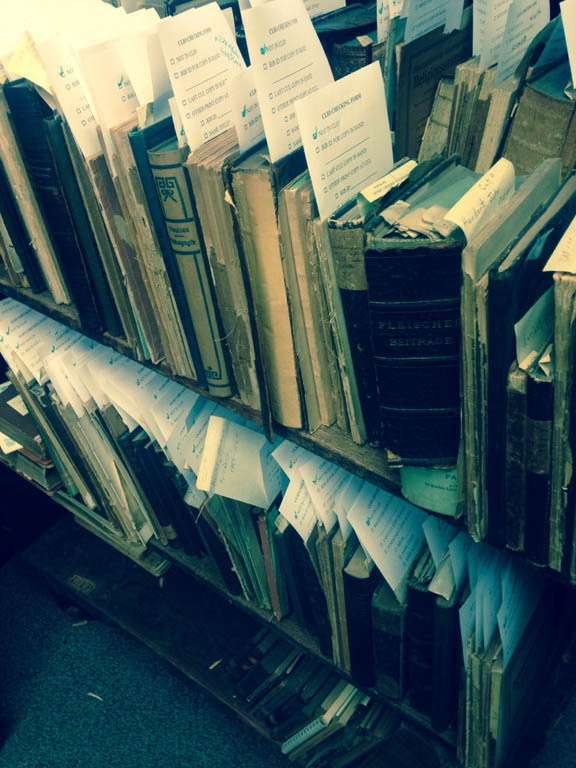 The records of the Union Commission and Union Assembly document the school’s history roughly from 1968 to 1974 and are housed within the Union Theological Records, 1829- held by the Burke. The Student Interracial Ministry Records, 1960-1968, also held by the Burke, are a testimony to a student-run ministry in which students, congregations and community members from racially diverse backgrounds came together to be part of a radically different and truly immersive hands-on approach to ministry education. This entry was posted in Archives, Collections, History, Student Entry, Student projects, Union Theological Seminary History on February 26, 2016 by Carolyn Klaasen. As I look back on the last four years and four months that I’ve spent as the project archivist at the Burke Library, I am so thankful to have had this opportunity. This position is what brought me to New York City. I’ve grown so much professionally and personally thanks to Columbia. My main priority at the Burke Library was to process, arrange, describe and make available collections. My first grant from the Henry Luce Foundation focused on the Missionary Research Library Archives and the William Adams Brown Ecumenical Library Archives. Over the three-year time period, my team of students and I processed 781 linear feet of archives (178 collections). Since the start of my second grant, which began in January 2015, 377 linear feet (45 collections) has been processed. In total, I’ve had a direct impact on scholarship, research and learning because I’ve made 1158 linear feet (223 collections) available for researchers. Apart from the archives having an impact on research, teaching and learning, the internship program that I created and run has been very successful. I supervised a total of 18 library school interns, not only from NYC schools but also from other locations in the USA, as well as France and Canada. They are now employed by museums, archives, universities, corporate businesses, seminaries and other institutions. I supervised 17 other students who were matriculated at Columbia or Union Theological Seminary. Thirty-five students in four years – not too shabby. 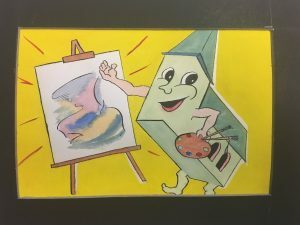 This very blog that you are reading started because I thought it would be useful to have students write more in-depth about their experiences with collections that were part of the first grant. Now it has grown into the general Burke Library blog and has so many voices and knowledge reflected by the posts. I also started running the Burke Twitter and Facebook pages; both of which have an ever-growing list of followers. All of these things are now in the very capable hands of Burke’s public services librarian, Elizabeth Call. She has taken these social media accounts into new and exciting venues and I’m looking forward to continuing to follow them. 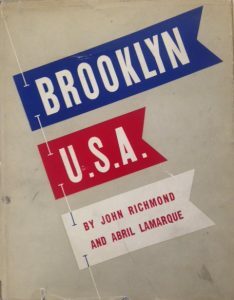 I’ve written reports; participated in Wayfinding studies; served on committees and other advisory committees; curated two digital exhibits; written newsletters; made the Burke more efficient with usage of space; created documentation; written LibGuides; presented in classes for Columbia, Union Theological Seminary and Barnard College; presented at conferences; and on and on. I’ve grown tremendously as a professional over the last four years in New York City. And really, what more could you ask for? I want to thank my amazing coworkers for being so supportive of me and bringing their own expertise to the table. I want to thank Alysse Jordan, who was interim director of the Burke Library when I first started in August 2011 – I could not have asked for a better “First Mentor” at Columbia (who I am very happy to call a friend now!). To my wonderful students that I’ve supervised over the past 4+ years: I’m proud to have been part of your career and look forward to watching you grow in our field. Thank you to all and I wish you the very best! 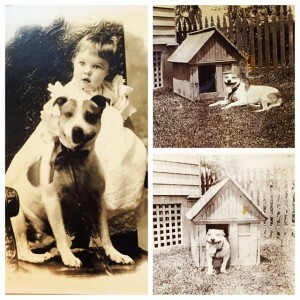 This entry was posted in Archives, History on February 12, 2016 by Brigette C. Kamsler. My job at the library resembles the craft of archaeology. On any day, I may come home from work with several centuries of dirt on my hands. This can be from crosschecking in world cat whether we have Der Kleine Katechismus Dr. Martin Luthers mit Erklarung Fragen und Antworten, or finding a 1921 map of Congo Belge in a box of uncatalogued materials. Sometimes it’s a bit more like P.I. business where I have to figure out if this anti- catholic tinged flyer suggesting doom for protestant America should JFK be elected president was written by the same group as that pamphlet suggesting the public school system is a “captive” of Popish control. But sometimes my job is like a gardener, what with all the dirt. I uncovered the bulletin for Booker T. Washington’s Memorial service, which took place 100 years ago. The effects of time on these documents end up on my hands. Closer to my own research interests are reprints of executive order 9066 from FDR ordering the Relocation of Japanese Americans along the west coast during World War II. There was also a photo bulletin showing the lives of Japanese Americans in the Internment camps, and another entitled “70,000 American Refugees made in America.” Perhaps most important about the experience for me is the chance to be reminded of what has happened to bring us to where we are. Pieces of history are in these stacks and archives, and every day I find out something I hadn’t known before. The thing I would most like to share is an interview I found with Dr. Vincent Harding in SGI Quarterly. Among the other quiet gems of Harding’s spirit and words, are his cautious approach to memorializing the phrase civil rights movement, which he thinks can be seen by our generation in terms of “success,” and therefore conclude that the struggle is “finished.” Harding would encourage us to speak instead of “the expansion of democracy,” reminding us of our responsibility to our ongoing task. I perform a very small role in the vast process of memory and integration that is ongoing here at the Burke. While it’s not often pretty, it helps us remember, and understand, and hopefully participate in taking responsibility, together. This entry was posted in Collections, History, Student Entry on October 30, 2015 by Octavio Carrasco. I started at the Burke Library a little over a year ago. Not coming from a theological background, I was a little intimidated. However I quickly saw how my background in public history and public services could help do effective outreach to promote usage of the amazing materials in our special collections by Union students. It was during my first Student Senate meeting where the new senate officers announced that they would be adopting the theme #LoveInAction. Based off of the infamous words of Union professor, Cornel West, “Never forget that justice is what love looks like in public,” #LoveInAction embodies perfectly the activist spirit held by the students, alumni/ae and faculty at Union both today and yesterday. Seeing an immediate link between Union’s archives and this sentiment, I saw the potential in getting students aware of Union’s history not just through other’s words but through their own research experiences. With the approval from the Burke Library’s director, Beth Bidlack, I set upon recruiting Union students to curate the library’s display cases that would help begin to tell of Union’s activist history. Three students were recruited, Benjamin Van Dyne (MDiv, 2017), Carolyn Kaasen (PhD cand. ), and Timothy Wotring (MDiv, 2016), to curate a series of three small exhibits in the library’s first floor display cases. Each student has curated an exhibit that narrates Union’s activist history in one area: Carolyn selected education; Benjamin, activism in action; and Timothy, local community involvement. 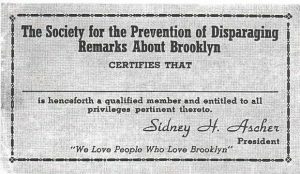 Timothy’s exhibit, which is currently on display until September 28, 2015, focuses on the East Harlem Protestant Paris (EHPP). Created by Union students in 1942 EHPP was an interdenominational ministry that provided leadership in the development of community life as served as an excellent example of an ecumenical ministry in a local, inner-city setting. For his exhibit, Timothy dug into the EHPP (1942-2007) records held at the Burke Library. Up next will be Benjamin’s exploration of activism in action, and will focus on Union’s archives relating to student-led activism. Primarily focusing on the time period between 1922 through to 1969, his cases hope to show the major shift in the civil rights narrative that occurred in the mid to late ’60s. Benjamin’s exhibit will be on view from October 5, 2015 to November 30, 2015. Carolyn has been researching forms of activism within education and has been sifting through the student driven and led Student Interracial Ministry (SIM) records (1960-1968) and archives relating to the Free University and the Union Commission. Carolyn’s exhibit will be on view in January 206 through to April 4, 2016. Each exhibit also has a program tied to it. For the unveiling of Timothy’s display cases, the Burke Library hosted a panel that was organized by the student curator and which brought 3 Union folks together, all of whom are at different points in their activist careers, to discuss the guiding philosophies of the EHPP founders. Benjamin is working with Burke Library staff and the Union alumni/ae liaison to put together a panel of Union alumni/ae and current Union students to reflect on how their education here at Union is preparing and/or has prepared them for a career in activism. This panel is to take place in the main reading room of the Burke Library on Friday, October 9th from 2-3:30pm, and is part of the roster of fabulous events planned for Union Days 2015. If you would like additional, more detailed accounts of this project please check back here as links will be added to articles that are slated for publication shortly! The next round would start in early January 2016 and run through the spring semester. The time commitment would be at least 3 group meetings during the semester as well as individual research sessions. Even if you feel you might not have the time to commit to being a student curator you can contribute to the project in other ways. 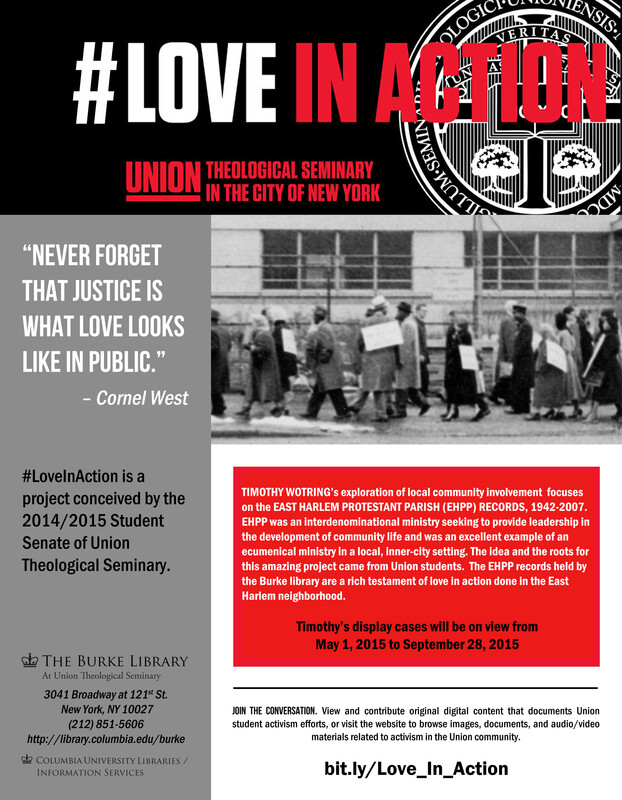 In order to help students document all of the work they are doing that celebrates the theme #LoveInAction, we have created a website that invites members of the Union community to contribute their personal photos, videos, writings, etc. 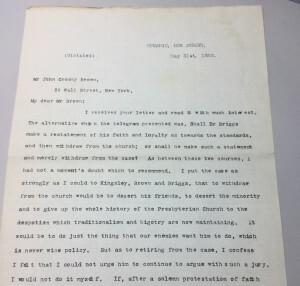 This entry was posted in Archives, Collections, History, Student projects, Union Theological Seminary History on August 7, 2015 by Elizabeth Call. So far this semester, I have had the pleasure of processing four collections within “Series 1. 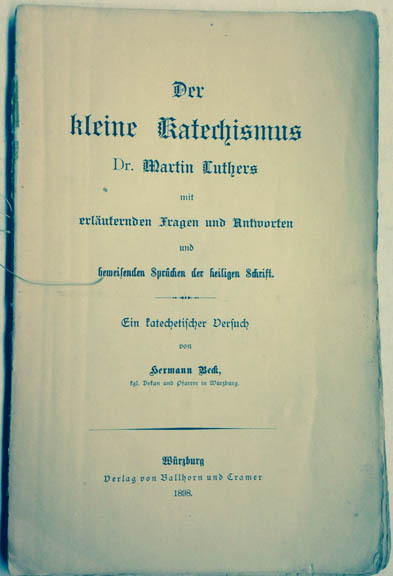 Papers of UTS Faculty and Students” of the Union Theological Seminary Archives. The creators of the first three of these collections had some things in common: all were born in the early-to-mid-19th century, male, and had long careers as pastors in the Presbyterian church. All were also prominent citizens of their time: George Washington Blagden occupied the pulpit at Old South Church in Boston, Massachusetts and Thomas Samuel Hastings preached at West Presbyterian Church in New York City and served as president of Union Theological Seminary during the Charles Briggs heresy trials. Phillips Brooks was famed for his preaching in his time and has been remembered long since, as he is memorialized in multiple published biographies and sculptures in Boston, Massachusetts and Alexandria, Virginia, and several schools bear his name. In many ways, these may be the kinds of collections one would expect to find within the UTS archives and when I was assigned my next collection, I was ready to pick up where I had left off and add another Presbyterian pastor to my processing roster. UTS1: Caroline Worth Pinkham Papers, 1867-1984, box 1, The Burke Library Archives, Columbia University Libraries, at Union Theological Seminary, New York. 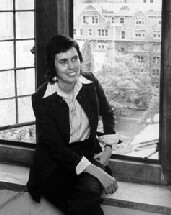 Born near the close of the 19th century in Flushing, New York and not a pastor, but, as I was to learn, the first woman to receive the Ph.D., from Columbia and Union Theological Seminary in the History and Comparative Study of Religion, Pinkham lived a long and fascinating life, which is chronicled in her papers. Raised with economic advantages and terrifically well educated, she held several jobs before marrying and moving to Lucknow, India, where she lived for several years in the early 1920s. 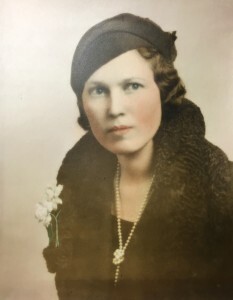 Back in the United States, Pinkham earned undergraduate, master’s, and doctorate degrees over a period of time while living with her husband in New Jersey, South Bend, Indiana, and Portland, Maine. She was also a published author many times over, beginning at age 15 with the publication of her vacation tale “The Devil’s Hole in Bermuda” in the Brooklyn Daily Eagle (Sunday, August 4, 1912 ) and ranging from academic writing such as her master’s thesis and dissertation to work intended for a more general audience like her A Bungalow in India: Intimate Glimpses of Indian Life and People (1928). Processing Pinkham’s collection was quite simple from the perspective of an archivist, as it arrived well-organized and in an access-ready order. Most of the work to be done involved skimming the collection for information for a biographical note and rehousing. The collection consists simply of a manuscript for an unpublished autobiography and manuscripts for a number of other books. The content of that material, however, is incredibly rich and paints a vibrant portrait of a thoughtful, perceptive woman who engaged in 20th-century life with brio. The collection also is enlivened by a large number of photographs as well as other ephemera, such as postcards, cancelled stamps, greeting cards, programs, and news clippings. One aspect of what makes Pinkham’s manuscript for Victorian Echoes, An Autobiography so special is that early on she begins weaving in excerpts from diaries that she kept during the time that she writes about. For example, she includes a diary entry from when she was 18 in which she said, “A day to remember: I traversed the numerous buildings of Barnard and Columbia. I was overpowered by their massiveness and splendor. They surely were great bulwarks of knowledge” and then reflects, “Now in my sunset years I might add to my early diary that little did I know then that one day I would attend classes at Barnard, and eventually be the first woman to get the Ph.D., from Columbia and Union Theological Seminary in the History and Comparative Study of Religion” (Box 1, Folder 6). As the autobiography continues, the retyped diary component becomes predominant and regular entries describe Pinkham’s day-to-day life: as a student at the Packer Collegiate Institute (“At school I had the pleasure of dissecting a poor sheep’s brain. If I don’t understand the working of a brain now, my own cerebral hemisphere must be a hollow cavity”), what she wore (“After two hours hunting for a coat, I have managed to get one at Nuttings. It is a navy blue corded serge. Style demands that I should wear a mustard shade, but that color makes me feel bilious just to look at it.”) and ate (“After German Club I went to H.S.’s at the Mohawk. We made fudge. I have never tasted richer confectionary! We used maple sugar, cream, chocolate, marshmallows, vanilla, and a pound of butter”), the lectures (“In the evening we three heard Dr. H. at Plymouth Church speak on The Russian Revolution We also heard him speak on the present war. He seems to be reaching the heights of his predecessor, Henry Ward Beecher. He hurled his condemnation on those Americans who do not show moral indignation at the indignities that Germany has inflicted”), sermons, and performances (“Mother took me to the Hippodrome. There was one startling act after the other; Sousa’s band, marvelous acrobats, dancers and skaters”) that she attended. “Everywhere you go, in everything you do, you find traces of the war. Our music is changing from silly love-sick tunes to popular martial strains. There are exalted themes even in posters and magazine illustrations. Perhaps because of the very horrors of war, we are turning to higher and more beautiful themes” (Box 1, Folder 7). “It is interesting to watch the different types of men at the office. There are hustlers and bustlers, dreamers and procrastinators, and some who are well rounded individuals. They all have to be handled with gloves. Each has to be catered to. Neither wants to feel that his work is not receiving the same amount of attention. The busier the man the less critical he is of trivialities. The real high mighty mites do not show their authority. They unconsciously command attention. It is not difficult to pick out the true executive” (Box 1, Folder 7). 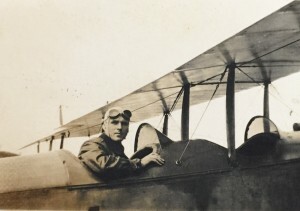 When she was 22, Pinkham met her future husband, a former aviator in the United States Air Service called Lloyd Francis Pinkham, at a September, 1919 dance at the Pershing Club, which was club operated beginning in 1918 to provide hospitality and accommodations to officers. 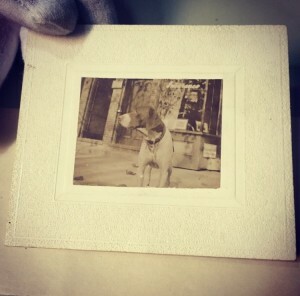 She wrote of him in her diary, “He said that he saw me in the subway with Mother. He decided that I must be going to the Pershing Club. With all of the activities that go on in N.Y., how did he know that? He rushed to the Y.M.C.A. 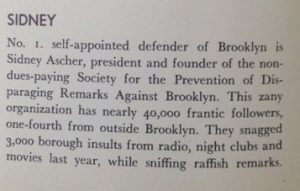 in Brooklyn, where he was staying, showered, changed his clothes, and sped to the Pershing Club” (Box 1, Folder 7). UTS1: Caroline Worth Pinkham Papers, 1867-1984, box 2, The Burke Library Archives, Columbia University Libraries, at Union Theological Seminary, New York. Less than a month later, Lloyd had left to return home to Maine before embarking on a stint of world travel and beginning work for Standard Oil in Madras, India. Included in the autobiography manuscript during this period, in the chapter “Courtship,” is the correspondence between Pinkham and Lloyd, which continues until Lloyd’s proposal in 1922. “Today I was very much pleased to receive Christmas and New Years Greetings from a very good friend of mine. Oh! You could never guess? She is a very sweet little dancer, whom I used to ‘trip the light fantastic’ with at the Pershing Club, when I was a young chap and not burdened with business cares. I believe that she is a voter in your home town, is registered as having no occupation in particular, but really does teach a Sunday School class on the Q.T. She eats ice-cream and cake, attends lectures on the Philippine Islands, a very interesting conversationalist, an accomplished violinist, uses a royal typewriter, is very thoughtful and considerate of her friends and on the whole she is one of these true blue, fourteen karat young ladies that would just cause one to know her ‘to find something about everything to be glad about’” (Box 2, Folder 1). “He said today that he wanted me to be able to do everything he did. – Oh, the joy of a real companion for a husband” (Box 3, Folder 3). “While other folks find it difficult to take two credits, my wife steps out and takes eight, lives in another State, and drives fifty miles back and forth each day. I am quite aware of the mental effort and push it requires to accomplish that, and also get the rank that you do in your studies. You have such a keen insight into things that I always like to get our observations and deductions on my problems. I sure could not live without you” (Box 4, Folder 11). 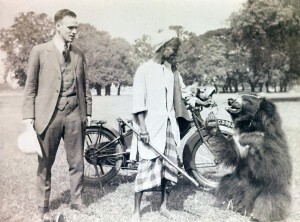 After marrying Lloyd, Pinkham returned with him to India, where they lived during 1922-1925. For this period, included in the autobiography manuscript material is a set of letters from Pinkham to her parents in which she describes her life in India, as well as larger events of the day. “There has been a great rejoicing among the natives for the past few days, due to the fact that the Government has released Mohandas Karamchand Gandhi” (Box 3, Folder 7) and, in further depth: “Great masses of Indians are becoming educated and want to run India. They are, of course, not fully educated because of the years of suppression, and if they do get Home Rule will probably make a sad mess of it at the beginning. There is a lack of unity among the Indians. The Muhammedans are always rising up against the Hindus and vica versa. Because of this fact, England for many years has been able to pit one against the other, so to speak, and rule on the side line, but things are changing. There is really not the opportunity to invest in things out here, because times are so changeable. If the Indians demand home rule, I am inclined to think that Europeans will be able to reside only in the largest cities and then just for commercial purposes. If the Englishman goes in India, the American will have to go too, I think” (Box 3, Folder 5). Combined with the courtship correspondence between Lloyd and Pinkham, these letters to her parents constitute a spectacular source of primary source material of expatriate American life in India during the early 1920s, a time when organization against British colonial rule was increasing. This entry was posted in Archives, Collections, History, Student Entry on May 29, 2015 by Katherine Palm.